© Hans Decoz - 2019. All rights reserved. In Numerology each letter has a corresponding number and their placement determines the kind of influence it has on you. 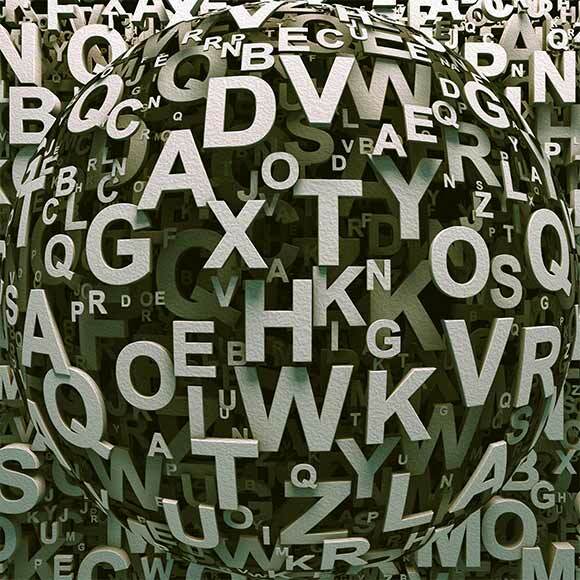 Some letters, such as the first letter of your full name, or the first vowel, are more influential than others. First, let's look at the Cornerstone. This is the first letter of your name. It provides general insight about your essential personality, and it has a lot to say about your approach to life's speed bumps and open doors. In other words: the Cornerstone in your numerology chart is all about how you approach both difficulties and upswings. The Capstone is the last letter of your name, and, fittingly, it demonstrates your ability to see projects and ideas through to the end. This translates into your "finishing" number. When you look at your Cornerstone and Capstone -- the letters that "bookend" your name -- you can determine how easy it is for you to start and stop important processes and projects. It answers questions like: are you a shaker and a mover? Are you a little bit flaky? A numerology reading should include descriptions of these special letters. Now look to the first vowel of your first name -- this letter gets to your core. Think of the deepest goals, urges and dreams that drive you in all you do -- this is the letter offers a glimpse into this area of life. But this is a secretive letter, because few people wear what it really is they want on their sleeve. This first vowel in your name indicates something that only your closest friends and trusted family members might know about you ... and it's also a very telling "window" to your soul! You might know someone who for whatever reason changed the first vowel in their name. Although this is rare, it indicates a person who is uncomfortable with who they really are, at their core. In our numerology chart system, you will notice a triangle divided in three sections. The top shows the Key, the left bottom is the Cornerstone, and the right bottom shows the Capstone. Learn more about these special letters in this chapter of our numerology course. Here is an alphabetic list to understand your name from Cornerstone to First Vowel to Capstone. You can decode your own name by focusing on these three things. Here's an example: let's say your name is Anna. With "A" as your Cornerstone Letter, you are ambitious about starting new endeavors. With "A" as your First Vowel Letter, you might hide this ambition -- perhaps you are the quiet creative type. With "A" as your Capstone Letter, you push this motivation through to the end, seeing projects to their completion. You are sensitive and a bit of an introvert, but still manage to be personable and compassionate. You are all about peace -- you need it in order to be happy. Although you are very loyal, make sure to keep an open mind and think for yourself more often. You wear your heart on your sleeve -- lucky, since you have a strong instinct about matters of the heart. You express yourself clearly and are also witty -- a "life of the party" sort. You are also very outspoken and upbeat. You are a visionary, but you also tend to make a lot of money and lose it fast. In the long-run, however, you will probably be fine -- your creativity will serve you well. You think from the gut and might prefer to be alone. Fight any doubts you might have about yourself and spend plenty of time outdoors! You are a compassionate person who feels things deeply. It makes sense, then, that you are also artsy and creative, with a great eye for everything from fashion to composition. Make sure you stick close to projects and have direction -- otherwise you might suffer from anxiety. Balance is key. You are a "think outside the box" kind of person -- creative and original. You are also strong-willed with the opinions to match. You are systematic about your life, documenting experiences in diary form, and might have your share of romantic "entanglements." You are a real charmer. With a sense of warmth and devotion, you also feel things deeply -- this can lead to overly dramatic reactions and an intense inner life. Make sure you carefully consider every decision, and take care to whether your many emotional ups and downs. You like life in the fast lane. Remind yourself to slow down, because you are often taking on new and exciting projects. You're also assertive -- even aggressive -- in your personal relationships. Keep your feelings and outward appearance in check, and don't get too sensitive. You have a give-and-take kind of life. You might gain a lot, only to lose it, but will always break even. Teach yourself to think faster on your feet and then commit wholeheartedly to whatever project you're involved with. Tap into your instinct and creativity, as well as your impeccable sense of timing and luck! Also, you are naturally predisposed to be glamorous -- play it up! You are a seer -- you have great intuition. Sometimes you may even feel psychic. But be careful -- with a strong imagination, it may be hard to separate fact from fiction. You have lofty goals and the will to bring them into reality. Use your efficiency, but be careful not to be too eccentric -- that is a danger. Also beware your own unpredictability and possessiveness. You think from the gut and you have a great sense of purpose. You are also an active person -- mentally and literally: you like to be involved in as many activities as possible. Your charisma means you surround yourself with interesting people, because you stimulate excellent conversation. Try not to put things off, and take full advantage of your own creativity. You are freedom-loving and like to break rules and push the envelope. Your ambition and courage make you naturally independent, even though you come across as reserved. You are stylish. Be careful not to be too slow in making decisions -- trust your natural gift of intuition! You are naturally upbeat and charismatic. You always walk on the sunny side of the street, so to say, but also have high standards. You balance this out with common sense and understanding -- compassion is a strong suit of yours. You are wise and quick to think on your feet, but be careful not to be impatient or impulsive.